Shopping News Media Play Search4Now ?????? GET a free Fun Meter! Like a free Fun Meter! It is really simple! 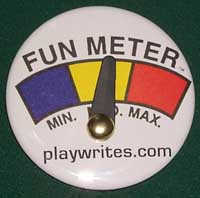 Just join our mailing list, we will send you a free Playwrites Fun Meter Button by mail. ...Join our mailing list, here! Get the greatest marketing tools-Click Here! Fun Meters are mailed out when we can. was scientifcally developed to bring the maximum amount of joy with the least amount of cost...FREE!! Having a bad day?? Just move the dial and peg out your Fun Meter! Your friend will be green with envy, thus making your day even better! !